Takedowns, wild jumps, drifting, branching shortcuts, car damage, online multiplayer and music from The Crystal Method — that's all I really wanted, and that's what Asphalt 8: Airborne delivers for under a buck. Mobile racers are getting prettier every day, and while Asphalt 8: Airborne isn't as gorgeous as EA's Real Racing 3, it's also much more dramatic and entertaining, and it doesn't shove in-app purchases in your face every five seconds. There are no timers here, and everything can be unlocked by a good player without paying anything more than the initial entry fee. And this isn't some stodgy simulation. This is speed and nitro and trading paint and gritting your teeth and ramming into your opponent so hard you feel like lighting a cigarette afterwards. Here, I made a video all about it. Warning: I get a little into it. 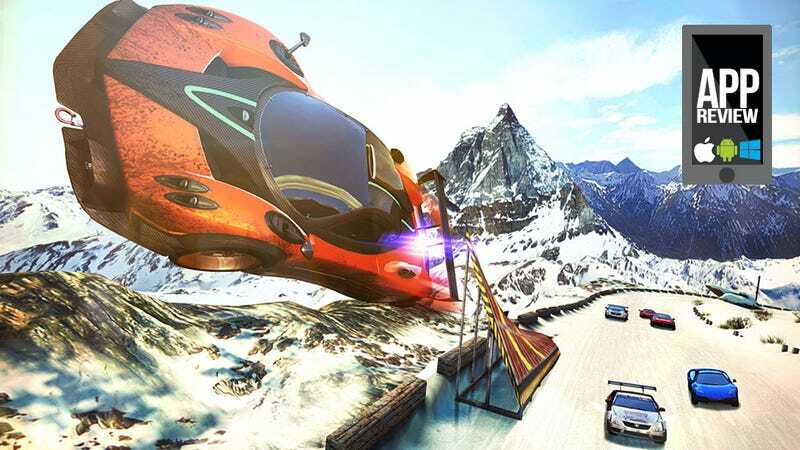 Asphalt 8: Airborne features 47 licensed cars, many never-before-seen in the series. There are 180 events in career mode, spread across eight seasons. It's beautiful, it's blazing fast, and it's got really solid online multiplayer. I made a video of a multiplayer match as well, but forgot to turn on my mic. It's for the best, as I was horrible and used made-up profanity like f***-neck. If you're a racing fan, Asphalt 8: Airborne belongs on every device you own capable of running it. I can't wait for it to hit Windows 8 later in the year.